Rediff – Virat Kohli-led RCB are struggling at sixth position after two wins and as many as four defeats. 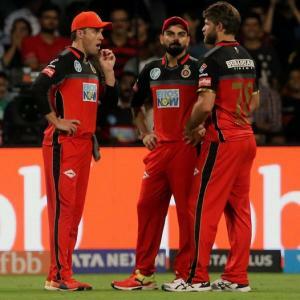 Virat Kohli-led RCB are struggling at sixth position after two wins and as many as four defeats, while KKR are placed fourth with three victories and four losses. The spin trio of Narine, Kuldeep Yadav and Piyush Chawla also contributed to KKR’s victory in the first match against RCB. The Chinnaswamy strip is likely to test KKR’s spinners while young Shivam, who was smashed for 29 runs by Shreyas Iyer, and England’s Tom Curran are likely to shoulder the pace bowling responsibility. Teams:Royal Challengers Bangalore: Virat Kohli (captain), Quinton de Kock, Brendon McCullum, AB de Villiers, Sarfaraz Khan, Mandeep Singh, Chris Woakes, Washington Sundar, Umesh Yadav, Yuzvendra Chahal, Colin de Grandhomme, Moeen Ali, Pawan Negi, Mohammed Siraj, Corey Anderson, Parthiv Patel, Tim Southee. Kolkata Knight Riders: Dinesh Karthik (captain), Andre Russell, Sunil Narine, Chris Lynn, Robin Uthappa, Mitchell Johnson, Piyush Chawla, Kuldeep Yadav, Shubman Gill, Ishank Jaggi, Nitish Rana, Vinay Kumar, Shivam Mavi, Tom Curran.